The latest version of the DCS Consumer Loader v5.00 has just been released. This is the PC software (free) for your computer to upload firmware to your TIU/Remote or upload/download sound files to MTH Protosound 2/3 engines. - Use 'My Computer' or 'This PC' on your desktop or use Windows file explorer to go to where the file was saved. - You now have two files "Setup.exe" and "MTH DCS Consumer Loader V5.0.0.msi". 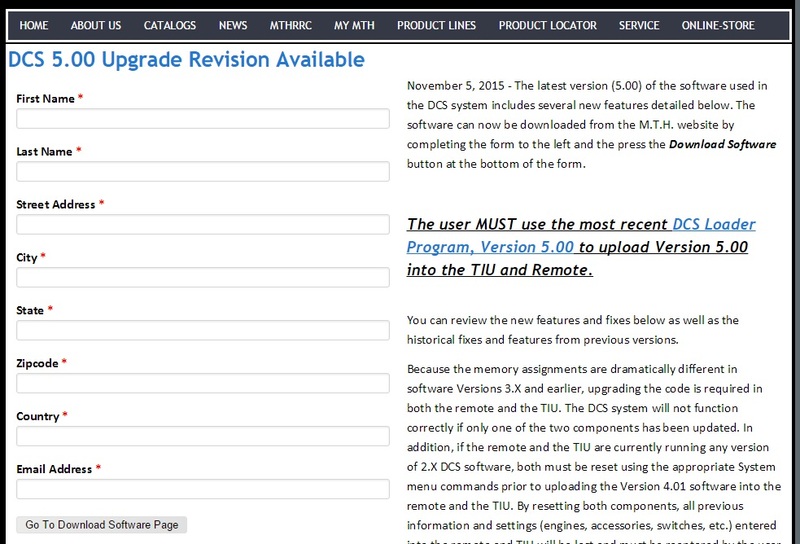 - Note where you saved your DCS TIU and Remote files from the steps below. - You now have three files. Two are the key ones you need "tiu5p0.DCSt" & "remote5p0.DCSr" to use with DCS Loader program. These files cannot be used on their own. Whatâ€™s New in version 5.00? This latest version of the DCS Consumer Loader software is used to program the DCS system components (Remote, TIU), Load sound files (in Proto-Sound 2.0 and 3.0 locomotives) and backup and restore the DCS Remote handheld. Among the many changes to the loader, the list below represents the most significant from previous 2.X DCS Consumer Loader software versions. Updated to load the new DCS version 5.00 to TIU and Remotes. 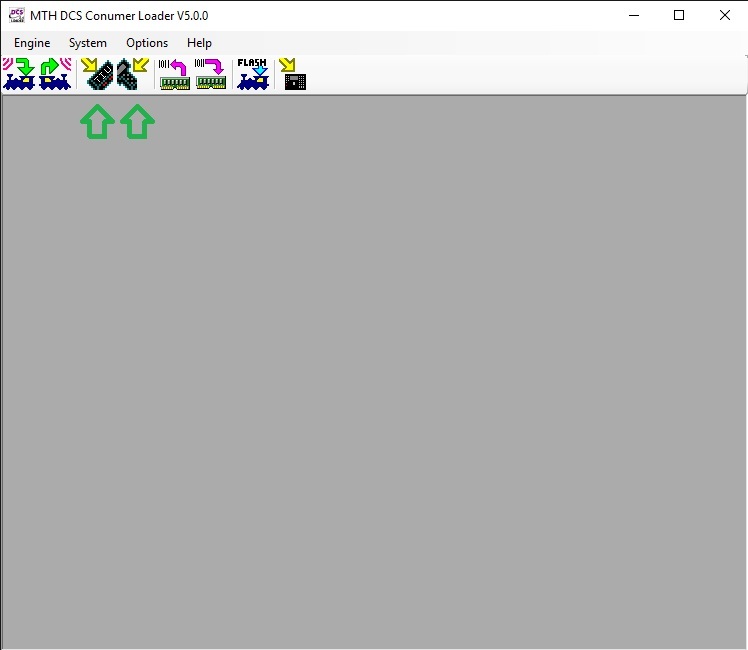 You MUST use this new DCS Consumer Loader in order to load DCS version to TIU and Remote. 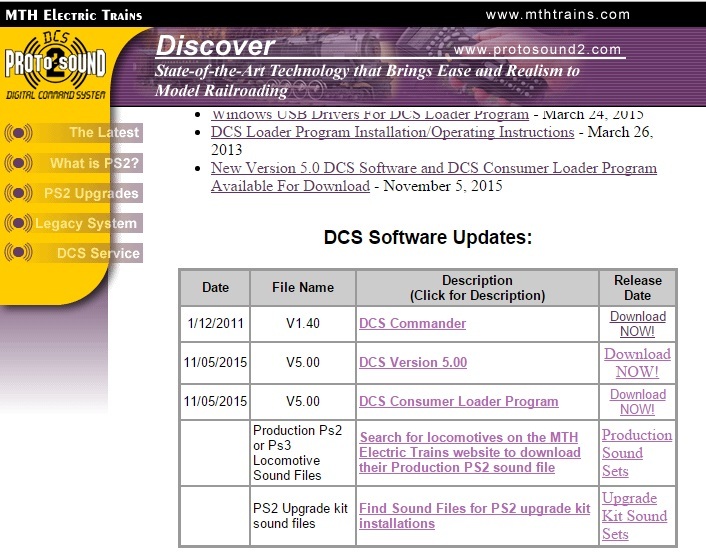 2.20, 2.30, 2.34 and 5.00 are the ONLY DCS Consumer Loader software versions you can use to program Proto-Sound 3.0 Locomotives. Using any previous version of the DCS Consumer Loader to program a Proto-Sound 3.0 equipped locomotive will disable the Proto-Sound 3.0 electronics and require the locomotive be returned to M.T.H. for repair. You can learn more about the issues with this warning by clicking HERE. An AC or DC Transformer. A PC running at least Windows XP. Mac users may find that running a Windows emulator might work. The below information details how the cables are to be used. The updated Loader program also will support USB-Serial adapters from most manufacturers. For those users that own the Rev L TIUâ€™s (released in December 2010) you can use a type A-B USB cable. This cable will also supply power to the TIUâ€™s processor so that you donâ€™t heave to bring along a transformer to power the TIU when you load TIU or Remote code. NOTE â€“ The USB cable does NOT supply power to ANY of the TIUâ€™s outputs. The mini-to-mini cable MUST BE A STEREO model. You MUST NOT use any cables that have adapters. M.T.H. p/n 50-1009 or *Click to buy*. Follow the instructions below for hooking up the cables. The DCS Loader Program will prompt you step-by-step for each of the loading options as you select them. TIU (Remote Input) Ensure the 4 conductors in the bottom of the Remote are all parallel and NOT touching one another. IF they do when you go to load the remote code your remote will power on. The Stereo mini-to-mini cable should be fully plugged into the Proto-Dispatch and Proto-Cast audio jacks on the TIU. When power is applied to the TIU, look at the red LED. It should NOT blink or flicker at all. It MUST remain on constant. This indicates that the TIU is in Program Mode. If the LED blinks then it means your mini-to-mini cable is not stereo, you have some other adapters on the cable, or you do not have the cable plugged in fully at one or both of the jacks. NOTE: When loading the remote code and prompted by the Loader program to hold down the power button on the remote, you should notice that your remote LCD remains blank. Your remote should not power up. If it does check the handset cord cable to ensure it has 4 conductors or inspect the jacks on the TIU and the remote to ensure no pins are touching or bent over. Also, you must remove the mini-to-mini audio cable PRIOR TO loading the remote code. You must also be sure to remove power from the TIU AFTER you have loaded TIU code.